The "new" course at St. Andrews is hardly that. 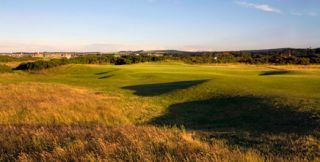 Designed by Old Tom Morris over 100 years ago, the New Course, like the Old, has difficult bunkers and double greens and plenty of thick gorse. The championship links layout is even tougher than its esteemed neighbor, however, demanding greater accuracy and shot making. Winds off the Eden Estuary can also factor into play.